There’s no doubt that Google is interested in the identity and access management (IAM) marketplace. The question is really how are they wanting to play in the identity management sector. In some ways, it is a complex marketplace with sectors such as cloud identity management, IDaaS, web application SSO, cloud directory services, identity governance and compliance, and many more. Our sense of Google Cloud Identity Services is that their approach to the market is a holistic approach for Google applications and services. We should step back and talk about the many different components of identity that Google leverages. They have your consumer identity with Gmail and often your Chrome browser login. Google has also invested in being a user management system for Google Apps (now called G Suite) and Google Cloud. Effectively, Google’s approach with cloud identity management on the enterprise side is to ultimately have one user identity that can be leveraged for Google services. It’s not clear whether Google truly wants to have Google Cloud Identity Services extend to a wide range of other IT resources such as those on-prem or with other providers. There is a level of complication and cooperation that is necessary to become a broader cloud IAM provider. Based on our view of their approach, Google will leverage their cloud identities for a few, select web applications via standard protocols such as OAuth or SAML. Cloud servers hosted at AWS or Azure, on-prem systems and WiFi networks, storage solutions, and a wide range of applications will likely be out of scope. For IT admins, this presents an interesting challenge. If you are using G Suite or Google Cloud, you may want those user identities to also extend to other IT resources both on-prem or in the cloud. G Suite Directory (now often called Google Cloud Directory) isn’t a core, virtual identity provider, but rather their user management system that underpins Google identity services. Then, you’ll want to take a look at Directory-as-a-Service. Tightly integrated with G Suite and Google Cloud, this cloud directory service is effectively what most IT admins would have wanted a cloud replacement to Active Directory to look like. As a neutral IT management platform, G Suite or Microsoft Office 365 credentials can be leveraged across the base of IT resources including your laptops, cloud servers, on-prem applications, storage systems, and WiFi networks. Effectively, your users have one identity across their entire IT resources. IT admins have one place to provision, deprovision, and modify user access increasing security and decreasing the level of effort. 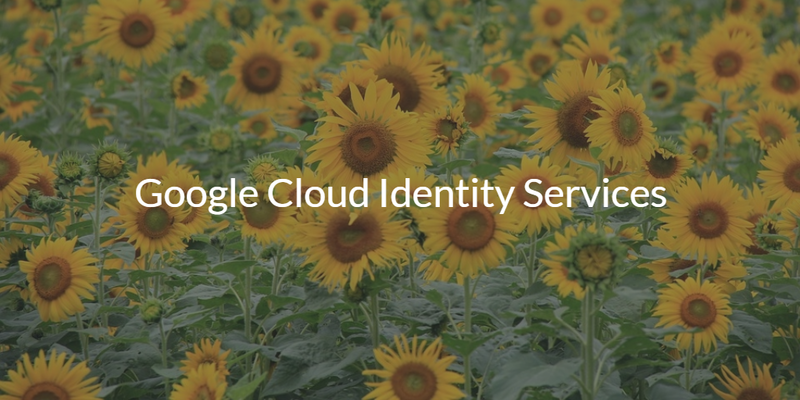 If you would like to learn more about Google Cloud Identity Services and how Directory-as-a-Service is playing that role for many IT organizations, drop us a note. Alternatively, sign-up for a free cloud directory account and see where you can take your Google identities. Your first 10 users are free forever.